Copper futures trading on the Comex market in New York declined sharply on Friday bringing to a halt a price rally that saw the bellwether metals come close to hitting three-year highs. Copper for delivery in December fell more more than 3% from Thursday's closing price to $3.0340 a pound ($6,706 per tonne) in morning trade. On Wednesday copper hit an intra-day high just shy of $3.18 a pound (more than $7,000 a tonne), the highest since mid-September 2014 and year-to-date gains remain above 20%. 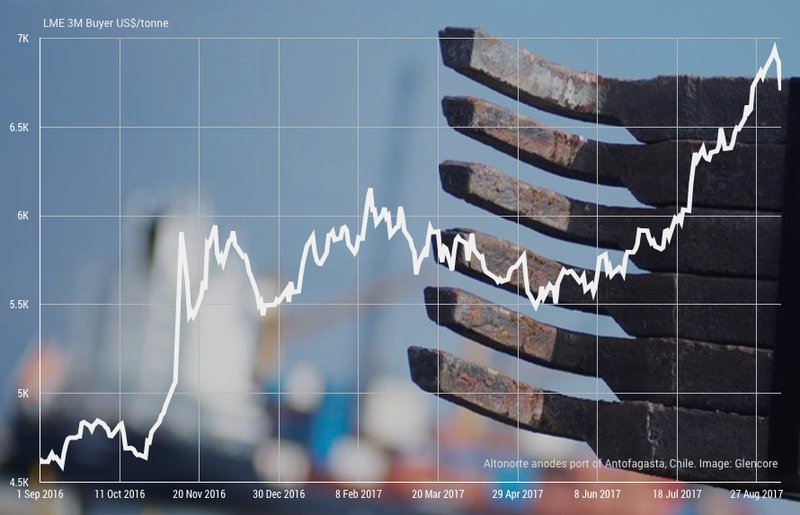 The drop on Friday came after customs data from China, responsible for nearly half the world's copper consumption, showed import volumes remained flat for the fourth month in a row. Chinese imports of refined copper totalled 390,000 tonnes in August, levels unchanged since May. While imports were up 11% from August last year, cargoes remain down nearly 13% over the first eight months of 2017 to just over 3m tonnes compared to the same period in 2016. Shipments of copper concentrate in August were up slightly from July but eased compared to last year coming in at 1.44m tonnes. Year to date Chinese concentrate imports total 11.1m tonnes, a 1.2% faster pace than January–August 2016, despite falling production at the world's number one producer Codelco and supply disruptions at some of the world's biggest mines including BHP's Escondida mine in Chile and at Freeport McMoRan's Grasberg operations in Indonesia. A correction on copper markets may have been overdue as speculative interest have been running ahead of industry fundamentals in recent weeks. Hedge funds built long positions– bets on higher prices in future – in copper futures and options to a new record high last week according to the CFTC's weekly Commitment of Traders data. So-called managed money investors' net longs now total 125,000 lots, the equivalent of over 3 billion pounds or 1.4m tonnes worth some $9.5 billion at today's price. It shattered the previous peaks achieved mid-2014 and represents the equivalent of a $13 billion swing from 2016 second quarter net short position (bets that copper can be bought back cheaper in future).